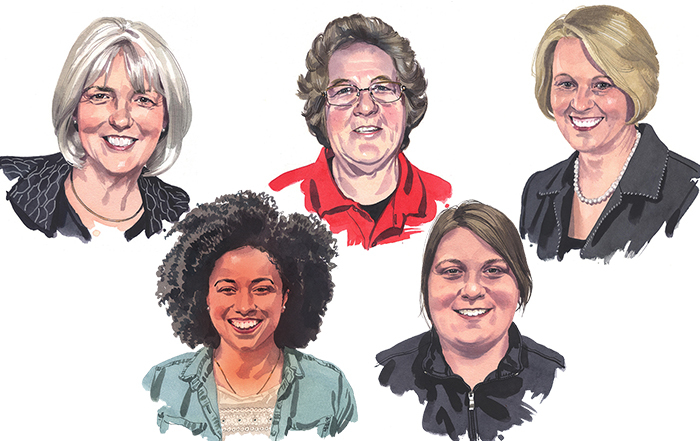 The advancement in agricultural education since the Smith – Hughes Act has bettered the quality of life not just for America’s rural and farm families but for everyone across the globe who is fed and clothed by the American Farmer. As with every great journey, it started with that first step. 2017 was the centennial celebration of the Smith – Hughes Act, America’s first step in transforming education. Virginia Tech agricultural education teacher educators Henry Groseclose, Harry Sanders, Walter S. Newman and Edmund C. Magill organized the Future Farmers of Virginia for boys in agriculture classes. The FFV served as the model for the Future Farmers of America. 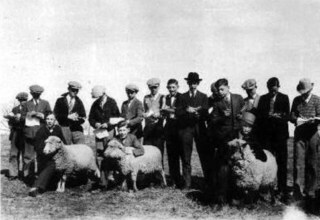 1926 - The First National Congress of Vocational Agriculture Students assembles for a National Livestock Judging Contest. The First National Congress of Vocational Agriculture Students assembles for a National Livestock Judging Contest at the American Royal Livestock and Horse Show in Kansas City, Mo. 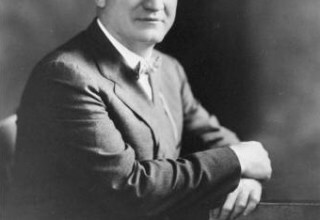 1927 - H.O. Sargent and G.W. Owens write the first constitution and bylaws for the New Farmers of Virginia. H.O. Sargent, a federal agent for agricultural education for African-Americans at the U.S. Office of Education, and G.W. 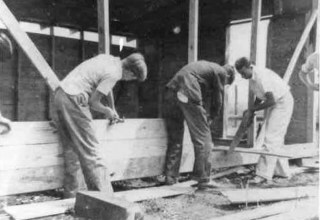 Owens, a teacher-trainer at Virginia State College, write the first constitution and bylaws for the New Farmers of Virginia, an organization for African-American agriculture students. The organization holds its first state rally that same year. 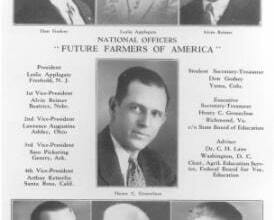 1928 - Future Farmers of America is established in Kansas City, Mo. Future Farmers of America is established in Kansas City, Mo. First National FFA Convention is held in Kansas City, Mo. : 33 delegates from 18 states (Arkansas, Arizona, California, Colorado, Idaho, Iowa, Kansas, Michigan, Nebraska, New Jersey, North Dakota, Ohio, Oklahoma, Oregon, South Carolina, Utah, Virginia, Wisconsin) are in attendance. Leslie Applegate from New Jersey is elected first national FFA president. First sectional gathering of New Farmers of America (NFA) members is held. 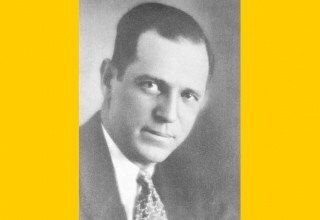 1929 - National blue and corn gold are adopted as official FFA colors. 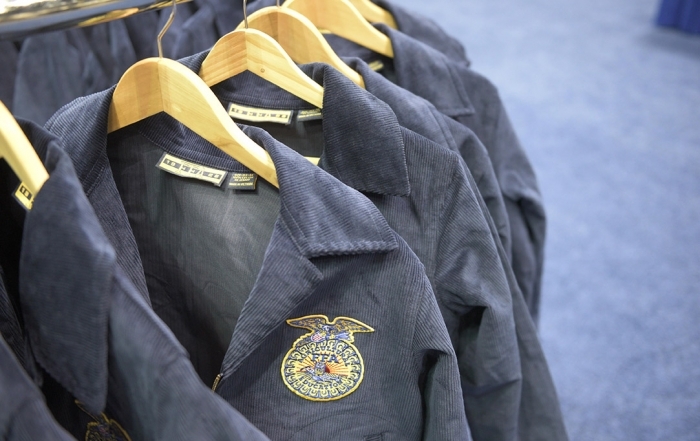 National blue and corn gold are adopted as official FFA colors. Carlton Patton from Arkansas is named the first Star Farmer of America. 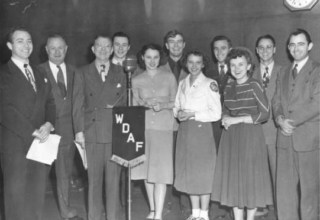 This is one of the first awards created by FFA, and it was sponsored until 1949 by the Kansas City Star. First National Chapter Contest is launched and sponsored by Farm Journal magazine. At the Second National FFA Convention in November, 33 states are represented by 64 delegates. Thirty-five state associations with approximately 1,500 chapters and 30,000 members are affiliated with the national organization. 1930 - Official FFA CreedOfficial FFA Creed, written by E.M. Tiffany, adopted. Official FFA Creed, written by E.M. Tiffany, adopted. First National Public Speaking event held. Winner: Edward Drace, Missouri. First Official Dress uniform adopted: dark blue shirt, blue or white pants, blue cap and yellow tie. Delegates restricted membership to boys only. First Official FFA Manual printed. 1933 - Blue corduroy jacket adopted as Official Dress. Blue corduroy jacket adopted as Official Dress. A group of FFA officers and members made a pilgrimage to Washington, D.C., where they were greeted on the White House lawn by President Franklin D. Roosevelt. 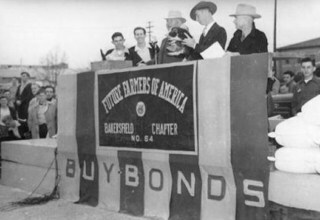 1935 - New Farmers of America founded in Tuskegee, Ala.
New Farmers of America founded in Tuskegee, Ala. Active FFA membership exceeded 100,000 members. During national convention, action taken to establish a national FFA camp and leadership training school in Washington, D.C.
28.5 acres of land purchased near Alexandria, Va., for the first FFA-owned national headquarters; the land was part of George Washington’s estate. Identical twins Albert and Arthur Lacy of Hondo, Texas, become the only members ever to share the title of Star Farmer of America. The “H.O. Sargent Trophy Award” was created to honor H.O. Sargent’s commitment to helping NFA members achieve success and leadership in agriculture. 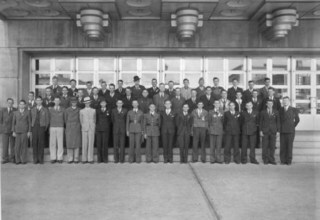 During World War II, when tens of thousands of FFA members served in the armed services, national FFA conventions were streamlined events where only delegates and award winners attend. 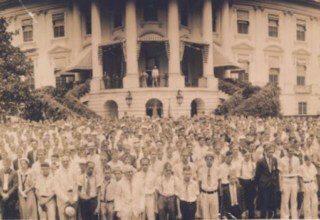 In 1942, just 217 people attended the convention. 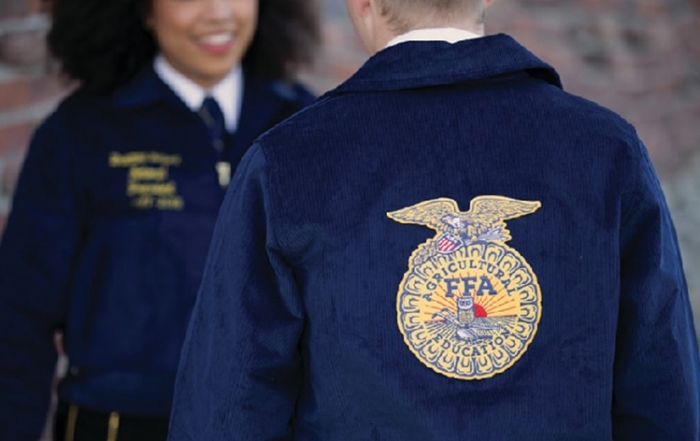 Future Farmers of America Foundation formed to raise money from business, industry, government, individuals and sponsors for FFA programs and activities. 138,548 FFA members were serving in the Armed Services in World War II. First National FFA Agriculture Proficiency Award presented for Agricultural Mechanics. 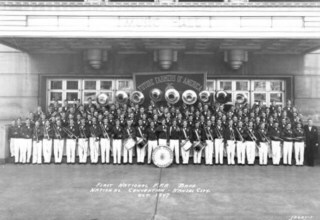 First National FFA Band performed at national FFA convention. 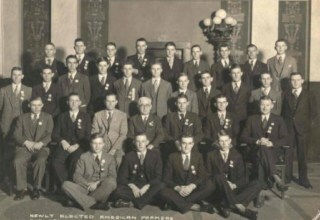 1948 - First FFA Chorus and National FFA Talent program held at national FFA convention. First FFA Chorus and National FFA Talent program held at national FFA convention. National FFA Supply Service began operation. Record jump in membership from 238,269 in 1947 to 260,300 in 1948; so many members attended the 20th National FFA Convention that a folding-cot hotel was set up in the basement of the Municipal Auditorium in Kansas City. First FFA Week celebrated during the week of George Washington’s birthday. Want to find more about the history of FFA? 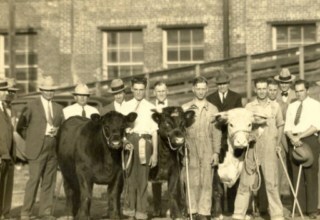 The National FFA Organization’s historical records are housed in the Philanthropy Archives of the Indiana University – Purdue University Indianapolis (IUPUI) library. 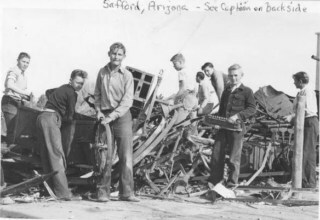 You can search the National FFA Records online for historical documents, pictures and more. An Ohio town is recognized for its landmark contribution to FFA history. 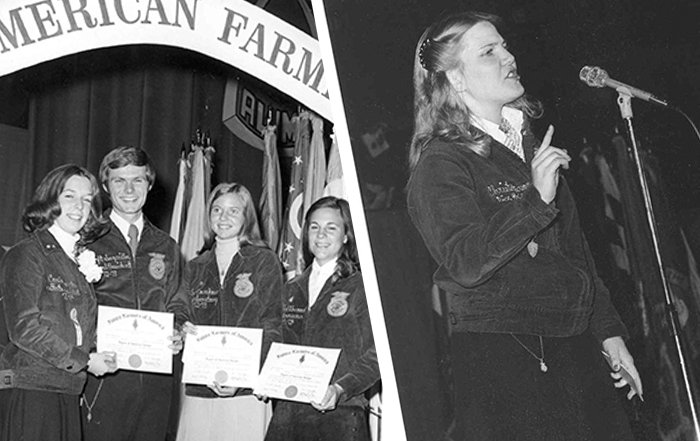 Fun FFA facts about FFA history, membership, convention and more.